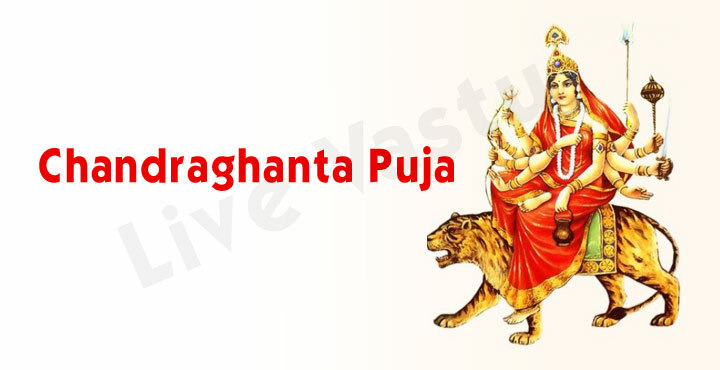 Goddess Chandraghanta, one of the nine incarnations of Durga, is worshipped with great enthusiasm and devotion by the Hindus all across the country. Her forehead has a ‘Half Moon’ in the shape of a bell and hence she is christened as Chandraghanta devi. The form of this goddess is extremely beautiful, blissful, peaceful and mesmerizing. She wears a white saree and is mounted on a lion which forms part of her vehicle. She has three eyes and ten hands, in which she carries different weapons and accessories like a Trishul, Sword, Gada, Kamandal, Bell, Arrow, Lotus and Bow. Many rituals and norms of worship are to be followed by the worshippers on the third day of Navratri pujan. On this day, all the Gods and Goddesses, including the Kalash which was placed on the first day of the Navratri pujan, needs to be worshipped. Lord Ganesha, Kartikeya, Goddess Saraswati, Lakshmi, Jaya and Vijaya, all need to be worshipped as they all form part of the family of Goddess Durga after having married Lord Shiva. Mahagauri or Parvatiji began ornamenting a half moon on her forehead after marrying Lord Shiva and hence the former began to be called Chandraghanta, representing strength, bravery and peace. On the third day of the Navratri puja, mantras should be chanted to please the Goddess and a fast must be observed for all nine days. Prasaadam Tanute Mahyam Chandram Ghanshteti Vishruta. The meaning of this Stuti is.. The supreme Goddess, Chandraghanta, who has a bell shaped moon on her forehead, is being worshipped by me. May all my bad deeds which I have performed during my lifetime be forgiven and washed away by worshipping this deity.